100 Things to Do in Houston Before You Die (Second Edition) is your passport to H-Town awesomeness. Let's face it: you need to get out more. And this is your chance. One of the great things about living in a city the size of Houston is that there's so much to do. Whatever you're into, you'll find it here--from quilting to photography to Norwegian Death Metal. But this book is for the OTHER things. The things you weren't even looking for, didn't know you needed in your life and can ONLY find right here in Houston. City life makes for a busy life. The problem is that many people end up working all the time. Staying home on their days off. Or maybe looking after the kids all day. Taking for granted all of the things there are to do around town. Don't be that person. Hey, you put up with the traffic and mosquitoes and hurricanes. So why not tap into the upsides of Houston life by getting out and really seeing what this city has to offer? And it has a LOT to offer, no matter what you're into. Houstonians are treating this handy pocket guide like a passport to the many things to do around town--keeping it in their cars, purses or desks and then flipping to a random page when they want to get out a bit. Many are even having the tour guide/bartender/waiter/ticket seller at each venue sign the page on their book as a symbol of their accomplishment. Even if you've already done many of these things, have you done them lately? Because while NASA or the Houston Livestock Show and Rodeo or Mai's Restaurant may not have changed--you probably have. 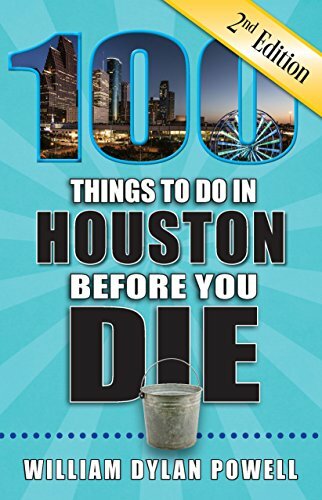 Order 100 Things to Do in Houston Before You Die (Second Edition) now on Amazon, and get your copy in just two days! Or do your community a solid and stop by your local independent bookseller such as Blue Willow Bookshop, Brazos Bookstore, River Oaks Bookstore or Murder by the Book. Check out all of these books on Amazon!